Artfully arranged cheese spreads like this one can elevate any gathering—and they’re surprisingly easy to create with just a few simple guidelines. If throwing an elaborate dinner party isn’t in the cards this busy fall season, don’t give up on the occasion. Consider, instead, the humble cheeseboard which, in the hands of Alice Bergen Phillips, is anything but. Phillips ran the cheese counter at Georgetown’s Via Umbria before breaking out on her own last year to start Cheesemonster DC, a cheese-based catering company. The name is a play on how customers often butcher the “cheesemonger” title (but, coincidentally, it also describes the effect a decent spread o’ cheese has on us these days). 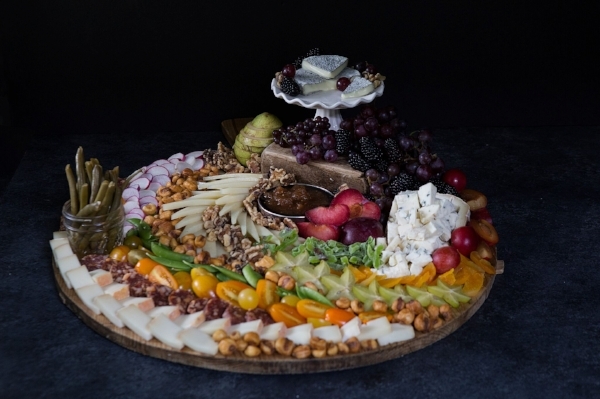 “The biggest thing is that it makes you happy,” Phillips says as she arranges pennant-shaped slices of Manchego into a semi-circle at the center of a giant wooden board. She suggests beginning every board with the cheese, finding a way to weave variety into each layer of its composition. Start by balancing contrasting flavors—salty and sweet, nutty and fruity, meaty and tangy—and continue with a variety of colors, sizes and textures. We asked Phillips, who will be opening her own cheese studio in Brightwood this fall, for some pointers on assembling boards worthy of their own occasion. Using a combination of cheeses—soft and hard, sweet and earthy—to liven up your spread. Cows aren’t the only animals that produce cheese-worthy milk. Consider goat- and sheep-milk cheeses, which can be as delicious and complex as your friends’ dietary restrictions. Balance the fresh, milky flavors of soft cheeses like burrata, with the intense flavors of aged Gouda or a nutty Gruyère. Don’t forget stinky, washed-rind cheeses and bleus. Combine cheese textures: spreadable, crumbly, semi-hard and the aged ones with crunchy crystals of flavor. Variation in color and size add depth and visual appeal to your cheese spread. Shade: Wander through the farmers market, produce section or dried fruit aisle with a rainbow in mind. Balance the bright white of cheese slices with deep-red pomegranate or amber-colored dried apricots. Size: Consider variations in the same hue, pairing a cluster of Concords with the tiny orbs of Champagne grapes and larger plums. The same rule can be applied to crackers of varying shapes and grains. Style: Combine the juiciness of fresh fruits with the tartness of dried ones. Recently pickled carrots or dilly beans can be as good as fresh vegetables for dipping into soft cheese or spreads. They also give gluten-free folks a vessel for schmearing. Salt: Don’t forget to leave room for sliced charcuterie, if it’s in the budget. Along with the usual salamis and prosciuttos, Phillips suggests trying artisanal jerky as an easy finger food. Sidekicks: Olives, Marcona almonds and fancy corn nuts can provide salty balance or crunch to a cheese tray. Whimsical jars of honey or jams add a sweet finishing touch. Including multiple types of cheese allows your guests to enjoy a mixture of flavors and textures. Try to offer at least three cheeses, even if they’re small slices for a party of two, to give the tray a balance of flavors. How much should you serve? A good rule is 1½ to 2 ounces of cheese per person, before filling in the board with other fixings. Make it edible. “A big pet peeve of mine is when cheese boards are offered in giant hunks,” says Phillips. “The biggest thing is making it easy for your guests to eat.” That said, don’t cut the cheese too far in advance or it could dry out. Serve cheese at room temperature for optimal flavor. Out of the fridge, softer cheeses can come to room temperature in as little as 15 minutes, but some hard cheeses could take an hour. Set reminders. Two hours is all you need to escape from DC to Virginia’s central Piedmont region, a world away where you can see the stars at night and find hidden gems around every corner. Whether you drive or take the hour and half train ride from Union Station to Culpeper, Virginia, pack a cooler—you’ll want to fill it with all the delicious food the area has to offer. First stop, Cibola Farms just outside of downtown Culpeper. Specializing in bison and free-range pork, their farm store is a great first stop on the way to cooking a tasty lunch or dinner. Ground meat and short ribs went right into our cooler. If you have the urge to roam after your travel, the farm also offers self-guided walking tours to see their bison herd and learn more about the farm’s operations. Next, head to charming downtown Culpeper, which is well worth exploration. We started at Moving Meadows Farm and Bakery. Located on a well-kept and recently rehabbed thoroughfare of East Davis Street, Moving Meadows is an excellent place to round out your picnic basket. The Hudson family (no relation tous) owns and operates this store and their passion for providing their community with quality products is apparent the moment you walk through the door. They mill their own flour using all non-GMO grains; make sure to ask for a demo of how they make “cool flour” with their mill. Heading west towards Main Street, stop in Raven’s Nest Coffee House for a quick pick me up on your way to Culpeper Cheese Shop. 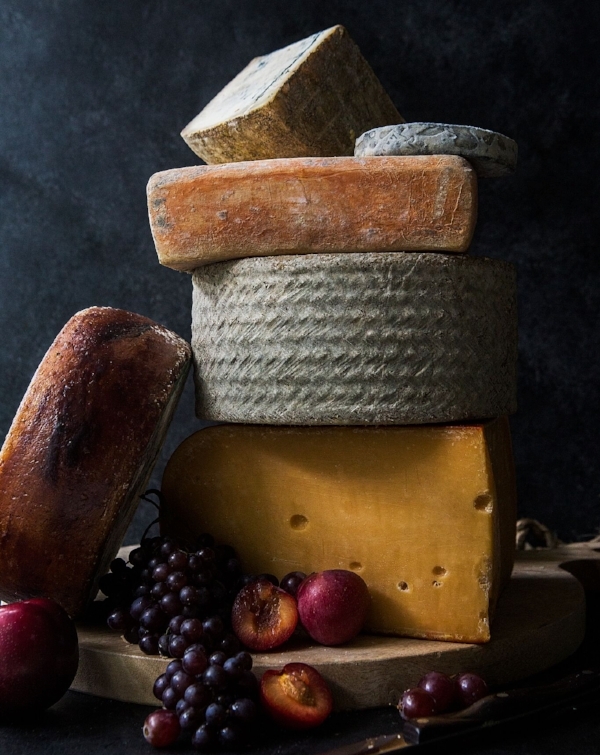 This boutique cheese shop maintains a selection of local artisan foods any store in DC would envy, including a wine room and home brewing equipment. Jeffery Mitchell, a former DC resident, offers cheese, meats and more for a Blue Ridge Mountain picnic and or for touring area wineries, where you might want your own cheese and crackers to enjoy with the local wine. Planning a weekend getaway? Twenty minutes down the road in Orange, the Inn at Willow Grove provides a wonderful respite. Housed in a stunning historic manor, the hotel was top notch in every way, with beignets and coffee delivered to bedside in the morning. Vintage, the Inn’s restaurant, offers fine dining that pulls local and regional ingredients to create a menu that changes based on seasonal produce. The Inn is also one of the few area hotels that welcomes dogs, so you don’t have to leave the pup behind. Saturday morning should be reserved for visiting local farmers markets. Perched atop a green hill, you’ll see the Madison County Farmers Market. It’s truly a community event, where local vendors come together to not only to sell their goods but also to catch up with friends. Standouts include bottled elderflower cordial from Brightwood Vineyard and Farm and local sausage from Rider’s Backfield Beef Farm. Mark your calendars because their harvest festival is October 29, a perfect weekend to visit. Culpeper Farmers Market is in the heart of Culpeper and just steps away from the train station and local shops. Make sure and grab a treat from Little House Bakers. This family-run stop has tasty freshly baked goods and also has gluten-free items! Esquire magazine named Virginia one of the best food regions in the country in 2014. We agree, it’s true. Wonderful local food is everywhere. For a quick, inventive and satisfying lunch, Real Food is a true gem. The menu changes weekly and offers only the freshest ingredients. Sweet but unassuming from the outside, the inside offers a clean, mod setting and creative food from the imaginations of Paul and Sarah Deigl, the wonderful couple who are the power behind all this deliciousness. Madison Inn Restaurant is also a great stop for lunch or dinner. Their pet-friendly patio is the perfect place to dine with the dogs and enjoy some creative cocktails. The Orange County area is chock-full of outdoor fall activity options. Fly fishing, horseback riding and hiking in the Shenandoah Valley are just a few. Should American history and architecture be your guide, James Madison’s home of Montpelier lies just down the road from the Inn at Willow Grove. The Montpelier Hunt Races will be Saturday, November 5, with the distinction of being the only horse race to take place at a presidential home. Of course, no trip to the area would be complete without experiencing Virginia’s wine. The first standout is Barboursville Winery (with their dog-friendly tasting room!). A visit to Barboursville will make you feel like you’ve stepped into the heart of Italy. Not a surprise since award-winning winemaker Luca Paschina, resident winemaker here since 1990, is from the Italy’s Piemonte region; he has certainly put Virginia on the map as a major wine region. You’ll want to make sure and do a tasting here. Our next stop, Early Mountain Vineyards, was equally satisfying but completely different, with its gorgeous modern tasting room that is Californian in style with a beautiful patio that overlooks the vineyards. Early Mountain makes great Virginia wine that you can you can taste your way through; their rosé has developed a cult following. A unique pleasure at Early Mountain is that they also provide a curated selection of other area winemakers’ products. So if you are interested in Virginia wine, this is a wonderful place to grab lunch, do some tasting and listen to live music, which they offer every weekend. They also host a lot of fun special events here, so make sure and check out the calendar on their website. As your weekend comes to an end, the drive back home can be made all the more exciting by a stop at the Inn at Little Washington’s Farmers Market in Washington, VA. Every Sunday until October 30, the Inn hosts a European-style farmers market with fresh produce, local products, flowers, music and, of course, food from the Inn. We loved our Carolina-style barbecue and baked goods and just the general ambience of the market. Don’t miss it.